Replacement cost: Scanner $199.00 ; OBD2 (DLC) Cable, $35.00 ; booklet, 5, 5.00 ; case, $20.00 . 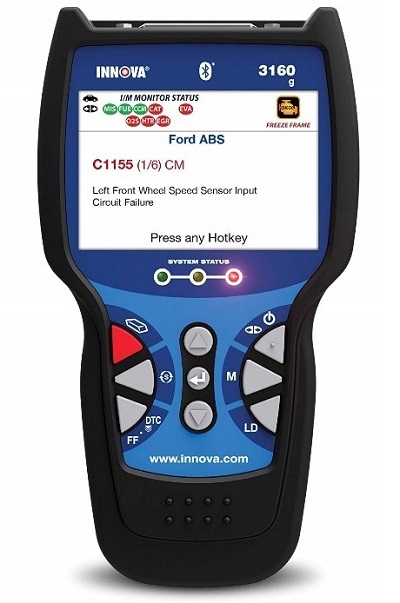 Innova 3160: Automotive Diagnostic OBD2, SRS, ABS Scanner. For auto technicians and those who wish to troubleshoot their own vehicles. Diagnoses ABS and SRS codes on most 1996 and newer GM, Ford, Chrysler, Toyota and Honda vehicles. Provides SAE enhanced Live Data—views, graphs, records, and plays back live PCM data streams on screen Professional OBD2 Generic Scan Tool for all 1996 and newer cars, light trucks, and SUVs: domestic, Asian and European imports. Features unique patented all-in-one backlit screen and LED display for quick State Emissions readiness check and drive cycle verification. Automobiles -- Maintenance and repair -- Equipment and supplies.